The structural features (morphology) and fundamental chemical processes (physiology) of xerophytes are variously adapted to conserve water, also common to store large quantities of water, during dry periods. Other species are able to survive long periods of extreme dryness or desiccation of their tissues, during which their metabolic activity may effectively shut down. Plants with such morphological and physiological adaptations are xeromorphic. 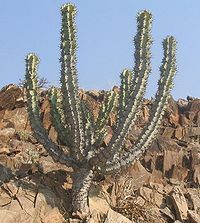 Xerophytes such as cacti are capable of withstanding extended periods of dry conditions as they have deep-spreading roots and capacity to store water. 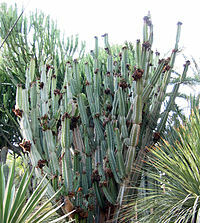 The leaves are waxy and thorny that prevents loss of water and moisture. Even their fleshy stems can store water. Plants that live under arctic conditions also have a need for xerophytic adaptations, since water is unavailable for uptake when the ground is frozen, such as the European resurrection plants Haberlea rhodopensis and Ramonda serbica. In an environment with very high salinity such as mangrove swamps and semi-deserts, water uptake by plants is a challenge due to the high salt ion levels. Besides that, such environments may cause an excess of ions to accumulate in the cells, which is very damaging. Halophytes and xerophytes evolved to survive in such environments. Some xerophytes may also be considered halophytes, however, halophytes are not necessarily xerophytes. The succulent xerophyte Zygophyllum xanthoxylum, for example, have specialised protein transporters in their cells which allow storage of excess ions in their vacuole to maintain normal cytosolic pH and ionic composition. Bushes, also called semi-shrubs often occur in sandy desert region, mostly in deep sandy soils at the edges of the dunes. One example is the Reaumuria soongorica, a perennial resurrection semi-shrub. Compared to other dominant arid xerophytes, an adult R. soongorica, bush has a strong resistance to water scarcity, hence, it is considered a super-xerophytes. If the water potential (or strictly, water vapour potential) inside a leaf is higher than outside, the water vapour will diffuse out of the leaf down this gradient. This loss of water vapour from the leaves is called transpiration, and the water vapour diffuses through the open stomata. Transpiration is natural and inevitable for plants; a significant amount of water is lost through this process. However, it is vital that plants living in dry conditions are adapted so as to decrease the size of the open stomata, lower the rate of transpiration, and consequently reduce water loss to the environment. Without sufficient water, plant cells lose turgor. This is known as plasmolysis. If the plant loses too much water, it will pass its permanent wilting point, and die. Under conditions of water scarcity, the seeds of different xerophytic plants behave differently, which means that they have different rates of germination since water availability is a major limiting factor. These dissimilarities are due to natural selection and eco-adaptation as the seeds and plants of each species evolve to suit their surrounding. The color of a plant, or of the waxes or hairs on its surface, may serve to reflect sunlight and reduce transpiration. 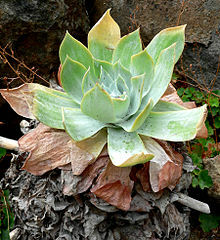 An example is the white chalky epicuticular wax coating of Dudleya brittonii, which has the highest ultraviolet light (UV) reflectivity of any known naturally-occurring biological substance. There are many changes that happen on the molecular level when a plant experiences stress. When in heat shock, for example, their protein molecule structures become unstable, unfold, or reconfigure to become less efficient. Membrane stability will decrease in plastids, which is why photosynthesis is the first process to be affected by heat stress. Despite the many stresses, xerophytes have the ability to survive and thrive in drought conditions due to their physiological and biochemical specialties. Plants may secrete resins and waxes (epicuticular wax) on their surfaces, which reduce transpiration. Examples are the heavily-scented and flammable resins (volatile organic compounds) of some chaparral plants, such as Malosma laurina, or the chalky wax of Dudleya pulverulenta. Heat shock proteins (HSPs) are a major class of proteins in plants and animals which are synthesised in cells as a response to heat stress. They help prevent protein unfolding and help re-fold denatured proteins. As temperature increases, the HSP protein expression also increases. Evaporative cooling via transpiration can delay the effects of heat stress on the plant. However, transpiration is very expensive if there is water scarcity, so generally this is not a good strategy for the plants to employ. Most plants have the ability to close their stomata at the start of water stress, at least partially, to restrict rates of transpiration. They use signals or hormones sent up from the roots and through the transpiration stream. Since roots are the parts responsible for water searching and uptake, they can detect the condition of dry soil. The signals sent are an early warning system - before the water stress gets too severe, the plant will go into water-economy mode. As the epidermis of the plant is covered with water barriers such as lignin and waxy cuticles, the night opening of the stomata is the main channel for water movement for xerophytes in arid conditions. Even when water is not scarce, the xerophytes A. Americana and pineapple plant are found to utilise water more efficiently than mesophytes. The plasma membrane of cells are made up of lipid molecules called phospholipids. These lipids become more fluid when temperature increases. Saturated lipids are more rigid than unsaturated ones i.e. unsaturated lipids becomes fluid more easily than saturated lipids. Plant cells undergo biochemical changes to change their plasma membrane composition to have more saturated lipids to sustain membrane integrity for longer in hot weather. If the membrane integrity is compromised, there will be no effective barrier between the internal cell environment and the outside. Not only does this mean the plant cells are susceptible to disease-causing bacteria and mechanical attacks by herbivores, the cell could not perform its normal processes to continue living - the cells and thus the whole plant will die. Under high light, it is unfavourable to channel extra light into photosynthesis because excessive light may cause damage to the plant proteins. Zeaxanthin dissociates light-channelling from the photosynthesis reaction - light energy in the form of photons will not be transmitted into the photosynthetic pathway anymore. Although some xerophytes perform photosynthesis using this mechanism, the majority of plants in arid regions still employ the C3 and C4 photosynthesis pathways. A small proportion of desert plants even use a collaborated C3-CAM pathway. The surrounding humidity and moisture right before and during seed germination play an important role in the germination regulation in arid conditions. An evolutionary strategy employed by desert xerophytes is to reduce the rate of seed germination. By slowing the shoot growth, less water is consumed for growth and transpiration. Thus, the seed and plant can utilise the water available from short-lived rainfall for a much longer time compared to mesophytic plants. During dry times, resurrection plants look dead, but are actually alive. Some xerophytic plants may stop growing and go dormant, or change the allocation of the products of photosynthesis from growing new leaves to the roots. These plants evolved to be able to coordinately switch off their photosynthetic mechanism without destroying the molecules involved in photosynthesis. When water is available again, these plants would "resurrect from the dead" and resume photosynthesis, even after they had lost more than 80% of their water content. A study has found that the sugar levels in resurrection plants increase when subjected to desiccation. This may be associated with how they survive without sugar production via photosynthesis for a relatively long duration. Some examples of resurrection plants include the Anastatica hierochuntica plant or more commonly known as the Rose of Jericho, as well as one of the most robust plant species in East Africa, the Craterostigma pumilum. Seeds may be modified to require an excessive amount of water before germinating, so as to ensure a sufficient water supply for the seedling's survival. An example of this is the California poppy, whose seeds lie dormant during drought and then germinate, grow, flower, and form seeds within four weeks of rainfall. If the water supply is not enough despite the employment of other water-saving strategies, the leaves will start to collapse and wilt due to water evaporation still exceeding water supply. Leaf loss (abscission) will be activated in more severe stress conditions. Drought deciduous plants may drop their leaves in times of dryness. The wilting of leaves is a reversible process, however, abscission is irreversible. Shedding leaves is not favourable to plants because when water is available again, they would have to spend resources to produces new leaves which are needed for photosynthesis. The leaf litter on the ground around a plant can provide an evaporative barrier to prevent water loss. A plant’s root mass itself may also hold organic material that retains water, as in the case of the arrowweed (Pluchea sericea). Land degradation is a major threat to many countries such as China and Uzbekistan. The major impacts include the loss of soil productivity and stability, as well as the loss of biodiversity due to reduced vegetation consumed by animals. In arid regions where water is scarce and temperatures are high, mesophytes will not be able to survive, due to the many stresses. Xerophytic plants are used widely to prevent desertification and for fixation of sand dunes. In fact, in northwest China, the seeds of three shrub species namely Caragana korshinskii, Artemisia sphaerocephala, and Hedysarum scoparium are dispersed across the region. These shrubs have the additional property of being palatable to grazing animals such as sheep and camels. H. scoparium is under protection in China due to it being a major endangered species. Haloxylon ammodendron and Zygophyllum xanthoxylum are also plants that form fixed dunes. Many xerophytic plants produce colourful vibrant flowers and are used for decoration and ornamental purposes in gardens and in homes. Although they have adaptations to live in stressful weather and conditions, these plants thrive when well-watered and in tropical temperatures. Phlox sibirica is rarely seen in cultivation and does not flourish in areas without long exposure to sunlight. Herbal extracts from plants of the Craterostigma genus are traditionally used by Kenyan natives as remedies to reduce inflammation and to relieve pain relating to the muscle and joints. However, scientific research on this practice revealed that these herbal extracts could cause hyperglasia. ^ Gechev, Tsanko S.; Hille, Jacques; Woerdenbag, Herman J.; Benina, Maria; Mehterov, Nikolay; Toneva, Valentina; Fernie, Alisdair R.; Mueller-Roeber, Bernd (2014-11-01). "Natural products from resurrection plants: Potential for medical applications". Biotechnology Advances. 32 (6): 1091–1101. doi:10.1016/j.biotechadv.2014.03.005. ISSN 0734-9750. PMID 24681091. ^ Liu, Hua; Wang, Qiuqing; Yu, Mengmeng; Zhang, Yanyan; Wu, Yingbao; Zhang, Hongxia (2008). "Transgenic salt-tolerant sugar beet (Beta vulgaris L.) constitutively expressing an Arabidopsis thaliana vacuolar Na/H antiporter gene, AtNHX3, accumulates more soluble sugar but less salt in storage roots". Plant, Cell & Environment. 31 (9): 1325–1334. doi:10.1111/j.1365-3040.2008.01838.x. ISSN 1365-3040. PMID 18518917. ^ Wu, Guo-Qiang; Wang, Qian; Bao, Ai-Ke; Wang, Suo-Min (1 March 2011). "Amiloride Reduces Sodium Transport and Accumulation in the Succulent Xerophyte Zygophyllum xanthoxylum Under Salt Conditions". Biological Trace Element Research. 139 (3): 356–367. doi:10.1007/s12011-010-8662-9. ISSN 0163-4984. PMID 20352373. ^ a b c d Zeng, Yan Jun; Wang, Yan Rong; Zhang, Ju Ming (April 2010). "Is reduced seed germination due to water limitation a special survival strategy used by xerophytes in arid dunes?". Journal of Arid Environments. 74 (4): 508–511. doi:10.1016/j.jaridenv.2009.09.013. ^ Ibañez, A.N. ; Passera, C.B. (February 1997). "Factors affecting the germination of albaida (Anthyllis cytisoidesL. ), a forage legume of the Mediterranean coast". Journal of Arid Environments. 35 (2): 225–231. doi:10.1006/jare.1995.0142. ^ Mulroy, Thomas W. (1979). "Spectral properties of heavily glaucous and non-glaucous leaves of a succulent rosette-plant". Oecologia. 38 (3): 349–357. doi:10.1007/BF00345193. PMID 28309493. ^ Jordaan, A.; Kruger, H. (February 1998). "Notes on the cuticular ultrastructure of six xerophytes from southern Africa". South African Journal of Botany. 64 (1): 82–85. doi:10.1016/S0254-6299(15)30829-2. ^ a b c d GINDEL, I. (April 1970). "THE NOCTURNAL BEHAVIOUR OF XEROPHYTES GROWN UNDER ARID CONDITIONS". New Phytologist. 69 (2): 399–404. doi:10.1111/j.1469-8137.1970.tb02438.x. ^ Atia, Abdallah; Rabhi, Mokded; Debez, Ahmed; Abdelly, Chedly; Gouia, Houda; Haouari, ChirazChaffei; Smaoui, Abderrazak (1 December 2014). "Ecophysiological aspects in 105 plants species of saline and arid environments in Tunisia". Journal of Arid Land. 6 (6): 762–770. doi:10.1007/s40333-014-0028-2. ISSN 1674-6767. ^ Schwab, K. B.; Schreiber, U.; Heber, U. (1989-02-01). "Response of photosynthesis and respiration of resurrection plants to desiccation and rehydration". Planta. 177 (2): 217–227. doi:10.1007/bf00392810. ISSN 0032-0935. PMID 24212344. ^ Zia, Ahmad; Walker, Berkley J.; Oung, Hui Min Olivia; Charuvi, Dana; Jahns, Peter; Cousins, Asaph B.; Farrant, Jill M.; Reich, Ziv; Kirchhoff, Helmut (September 2016). "Protection of the photosynthetic apparatus against dehydration stress in the resurrection plant". The Plant Journal. 87 (6): 664–680. doi:10.1111/tpj.13227. PMID 27258321. ^ Toderich, K. N.; Shuyskaya, E. V.; Rajabov, T. F.; Ismail, Shoaib; Shaumarov, M.; Yoshiko, Kawabata; Li, E. V. (2013). Combating Desertification in Asia, Africa and the Middle East. Springer, Dordrecht. pp. 249–278. doi:10.1007/978-94-007-6652-5_13. ISBN 9789400766518. ^ Belaeva, Tatiana Nikolaevna; Butenkova, Alina Nikolaevna; Astafurova, Tatiana Petrovna (2014). "Phlox sibirica L. in South Siberia". Biosciences Biotechnology Research Asia. 11 (Spl Edition Nov. 14): 371–376. doi:10.13005/bbra/1488. ^ John, Mwonjoria; Aliyu, Umar; Kevin, Juma; Titus, Kahiga; Piero, Ngugi; David, Mburu; Alphonse, Wanyonyi; Charles, Githinji; Joseph, Ngeranwa (25 August 2016). "Anti-inflammatory activity of craterostigma pumilum (hochst) is associated with hyperalgesia". International Journal of Pharmacology and Toxicology. 4 (2): 169. doi:10.14419/ijpt.v4i2.6497. ^ Dell’Acqua, G.; Schweikert, K. (April 2012). "Skin benefits of a myconoside-rich extract from resurrection plant Haberlea rhodopensis". International Journal of Cosmetic Science. 34 (2): 132–139. doi:10.1111/j.1468-2494.2011.00692.x. PMID 22023081. ^ Gechev, Tsanko S.; Hille, Jacques; Woerdenbag, Herman J.; Benina, Maria; Mehterov, Nikolay; Toneva, Valentina; Fernie, Alisdair R.; Mueller-Roeber, Bernd (1 November 2014). "Natural products from resurrection plants: Potential for medical applications". Biotechnology Advances. 32 (6): 1091–1101. doi:10.1016/j.biotechadv.2014.03.005. ISSN 0734-9750. PMID 24681091.